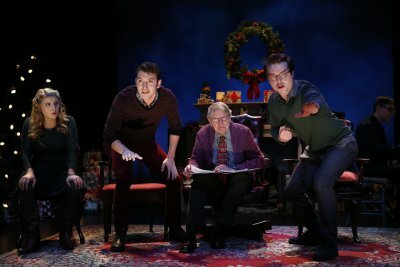 With his resonant Southern accented voice, stage charisma, and folksy manner, Broadway musical theater veteran John Cullum wonderfully takes on the aura of a kindly grandfather during his spirited performance in A Child’s Christmas in Wales. The audience enters to find that on stage are several various sized Christmas trees, gaily wrapped presents, a fireplace hung with stockings, a piano off to the side, a shimmering blue backdrop with a large holiday wreath in the center, and five wooden chairs. It’s all a quaint and lovely image. Accomplished musical director Mark Hartman goes to the piano and plays “Deck The Halls.” Mr. Cullum along with the youthful and talented company comprised of Jacque Carnahan, Katie Fabel, Kenneth Quinney Francoeur and Ashley Robinson enter and joyfully sing. Costume designer David Toser has festively outfitted the younger cast members in differing variations of red and green. Cullum wears a plum-colored cardigan, a bright striped shirt, and a Christmas patterned tie. This two-time Tony Award winning actor made his Broadway debut in 1960 in the original production of Camelot and it is always enriching seeing him perform onstage especially here in this intimate Off-Broadway venue. December, in my memory, is white as Lapland, although there were no reindeers. But there were cats. Patient, cold and callous, our hands wrapped in socks, we waited to snowball the cats. 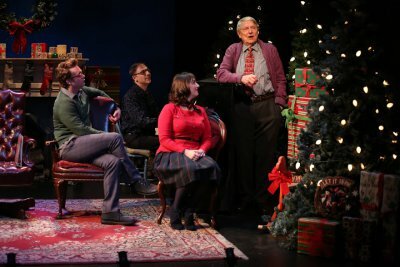 Over the course of just over an hour, the actors enact Dylan Thomas’ classic prose work of his childhood recollections interspersed with their sweet performances together and solo of familiar Christmas songs including “Silent Night” in his native Welsh. Cullum often sits in a chair holding an elaborately covered edition of the book, reading from and sometimes referring to it as if grandly telling a story. Ghosts whooed like owls in the long nights when I dared not look over my shoulder; animals lurked in the cubbyhole under the stairs where the gas meter ticked. In addition to celebratory sequences, several spooky incidents are depicted with the cast gleefully performing as if they were children. Michael Gottlieb’s cheery lighting design appropriately turns moody and sinister. The show has been performed several times by The Irish Repertory Theatre over the years and this revival is presented as its annual holiday production. It is directed by the company’s artistic director Charlotte Moore with assured simplicity. A Child’s Christmas in Wales began as a series of radio broadcasts in the 1940’s that Thomas delivered in Great Britain and appeared as a magazine story in 1950. It was published in a book in 1954, a year after his death. Ms. Moore’s adaptation is a lively and faithful theatricalizing of it. Always on Christmas night there was music. An uncle played the fiddle, a cousin sang “Cherry Ripe,” and another uncle sang “Drake’s Drum.” It was very warm in the little house. The appealing cast’s charming presence combined with the beautifully dressed stage makes this A Child’s Christmas in Wales look and feel like an idealized family gathering. The audience is sent off with a rousing “We Wish You a Merry Christmas.” Seeing this production is a delightfully comforting way to spend time during the holiday season. As written by Henry Naylor, enacted with vitality by Lvova, and directed with dispatch by Michael Cabot, Angel proves the far more effective half of the two-play evening.